"Glenn Beck Rally Attracts Estimated 87,000 CBS News" HT: Dan Friedman who notes "Open field filled with people on the left was over grown with trees and not available to people in 1963." Take a look at the "houses"? on the left side of the MLK picture. They aren't there in recent photo and appear to be filled with trees and people as well. Is Beck running for President? 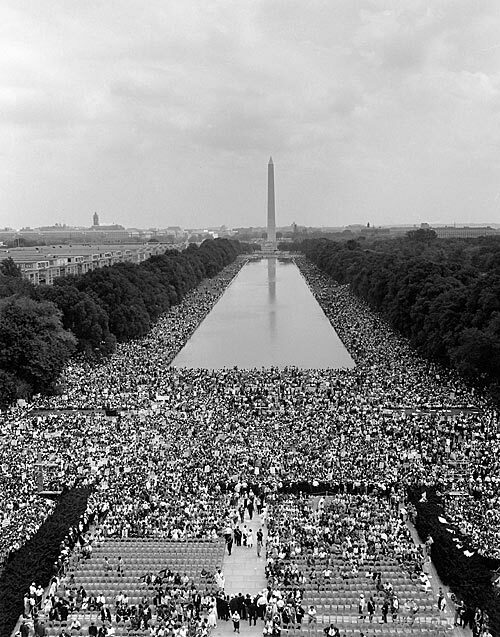 We are looking at one photo from the Washington Monument toward the Lincoln Memorial, and vice versa with the MLK gathering, too. 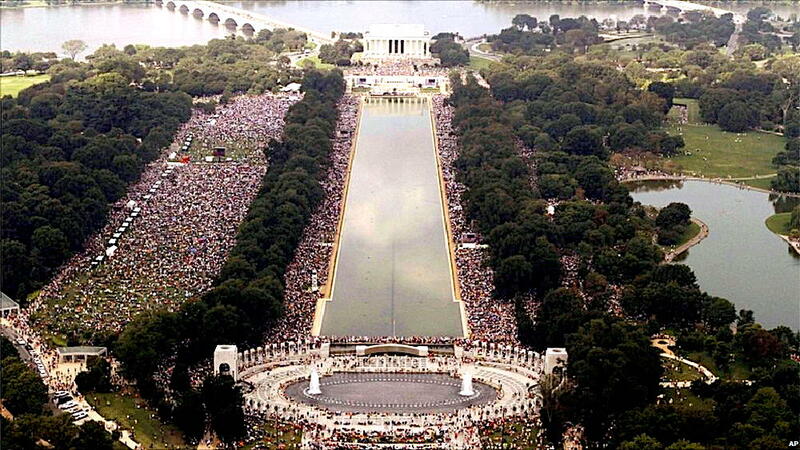 I tried to compare images of the Million Man March, but the results at Google images were difficult to use. Small. Some are fuzzy, and many with badly superimposed images of Calypso Louie on them. What a freaking joke. There may have been a mega turnout, but the pics look like some kind of weird third world tabloid published them. Maybe the mothership lacks proper camera lenses. Thanks for this nicely compared post of the two images, MLK and yesterday's rally. What can you say about media portrayals of Beck's rally as "tens of thousands?" Technically correct, but eerily, weirdly propagandist in their intent. I heard that filling from the LM to the WW II is 100,000, and the side area is another 100,000. Beyond that, you have to increase your estimate. My opinion is that it was 250,000 plus whatever. That is huge. Also, because of the wired age we live in, the social media viewership is significant. This crowd actually outdid Obama's inaguration crowd. @KCK: What can you say about such transparently "nuanced" language from the the geese at the MSM? These folks are sharper than marbles, and they have IQ's that number in the multiple dozens. They can't fool anyone who doesn't want very badly to be fooled.